I'm kinda lost doing patches, the last patch I did was with Live 08, a Boston Celtics pack and JUMP 08 was just on crack and never completed. Now this game, NBA2K9 came about, was installed on this humble unit last December, and I only thought of doing a patch just hours ago. Cheers to Glen for the guide. <-how I miss this emoticon. Last edited by Lean on Fri May 15, 2009 4:22 pm, edited 2 times in total. Re: One post more of a spam. It's really shiny but it just adds to the realness. NBA 2K9 fanatics. Get ready and prepare to JUMP! very nice! pls release!!! can you edit the alternate jersey of Denver also??? Enjoy, and may the Force be with us all. What is the next crappy stuff? not bad at all... thanks for posting! 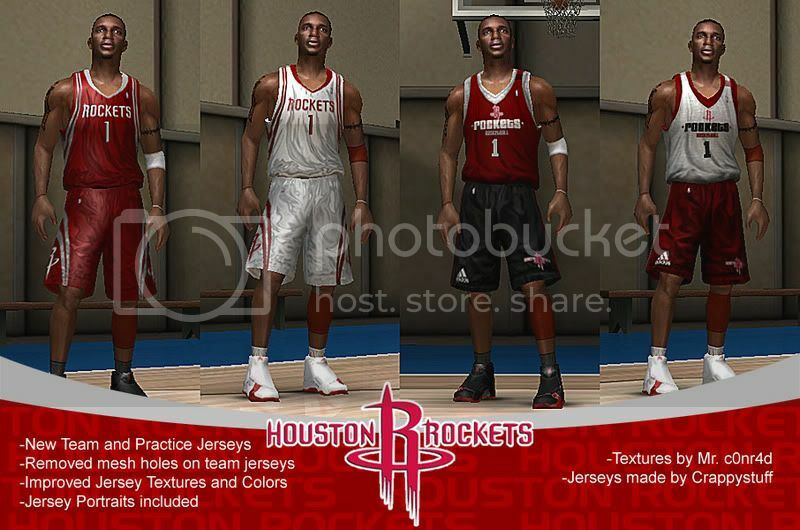 Freaking awesome.. can I request a crappy Rockets jerseys next? That of course, if you dont have something else in mind already.. The Rockets are next, watch out for previews. Jus a little request: can you also release Nuggets away alternate (dark blue) with yellow headband? very nice! release the rockets asap! Beautiful, great for my Nuggets association! Thank you!